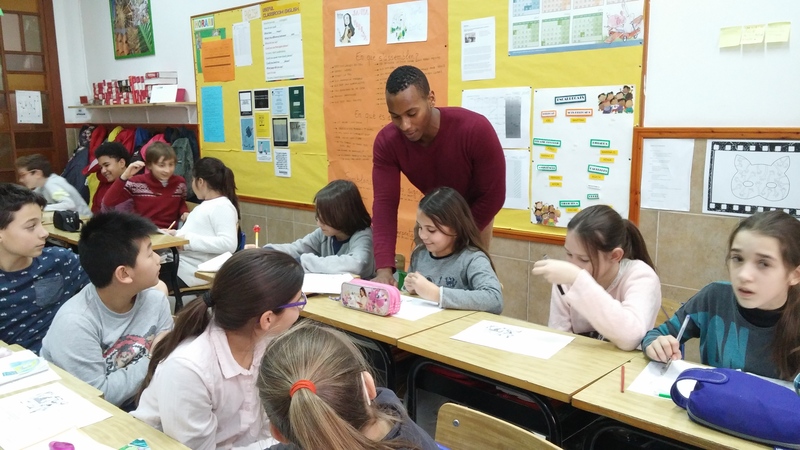 Santa Teresa de Jesús school, located in Vilanova, has been in the Conversation Assistants program for many years. This year they are hosting Kendall, who comes from the US. We leave you with the text that Kendall and his tutor, Roser, have written for us. L’auxiliar aquest any ha vingut de més enllà de l’Atlàntic, dels Estats Units: des de Boston a la nostra escola a Vilanova i la Geltrú. La seva llengua materna, l’accent i el bagatge cultural són totalment diferents als que estàvem acostumats d’altres auxiliars de conversa, que sempre havien vingut del Regne Unit o Irlanda. Aquest fet ens ha permès a tota la comunitat educativa gaudir i aprendre amb una persona de parla anglesa, però amb unes arrels i tradicions totalment diferents. Com cada any, l’auxiliar col·labora a tots els nivell educatius que tenim a l’escola, des d’infantil, passant per primària i secundària, i fins i tot a CF. S’està ocupant de grups reduïts de conversa, i col·labora també en altres projectes que es duen a terme a l’escola com l’English Song Contest, o la trobada amb alumnes anglesos de Plymouth. Com a tutora de l’auxiliar, crec que ha estat molt enriquidor per als alumnes poder posar al mapa un país tan gran i tan divers com els Estats Units gràcies a tot allò que ens ha relatat el Kendall. Vilanova i la Geltrú is a comfortable and very active town located about 40 minutes outside of Barcelona city. Since October, I have had the privilege of teaching as an English conversation assistant at Col·legi Santa Teresa de Jesús — situated right in the heart of the town center amidst bustling cafes, tantalizing food shops, and numerous cultural sites. My experience thus far has been absolutely phenomenal. The tapas and local dishes are too good to be true, the beaches are absolutely beautiful, and the people are open and carefree. Catalonian culture is very laid-back, which is very different from the hurried and rushed life I was used to in the United States. I adore how open and warm the Catalonian people are and have had no trouble in finding people to talk to and make acquaintance with, whether at the gym, bar, or bus stop. Apart from having some of the best food of my life, witnessing some of the most captivating landscapes, and meeting some of the most interesting people during my stay here, I have also had the chance to help the locals out with their English in the school and in my private lessons. In the school I teach students from ages 6 through 22. At first, the news that I would be teaching students from the primary level up through the vocational courses was daunting, and creating lesson plans to span the breadth of the age gap did prove challenging, but within a few weeks I was able to get the rhythm down and things became much smoother. In fact, the most challenging aspect of my work soon became the most enjoyable; the wide array of ages that I teach makes for an equally wide diversity in the lessons that I give. On a typical day, I could go from talking about animals and colors in the primary classes, to debating global issues with the older students in ESO all within the same morning. I also love how, no matter the age, the students usually do not hesitate to express how they feel (for better or for worse), and this always makes for an interesting and interactive classroom environment. Throughout my time with Santa Teresa, my tutor Roser and the entire faculty have always been there for me if I ever needed anything and have always offered a helping hand. Moving to a new country is challenging enough, but knowing that I had a support system made the transition as seamless as possible. I am now living with my second host family, and have been pleasantly surprised at and will be eternally grateful for the level at which both of my host families have opened up their homes and family lives to me, a stranger. Before coming to Spain, I had never lived outside the United States, and even though I had considered myself open-minded and globally-conscious, I had not really seen with my own eyes an example of what life is like outside of American borders. I have called this poble my second home for the past 5 months will continue to do so for the rest of my life.